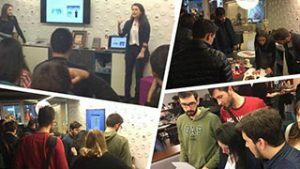 In addition to the long-term internships, in the CO-OP Education Model, seminars, conferences, and workshops are organized with the support of the partner companies for personal development and career development of the students. The subjects, duration and the content of the career support activity to be arranged is designated with the coordination of the relevant faculty/department, Dean’s Office and students clubs according to the current issues and students’ demands and needs. These events can be organized in a variety of genres and content, from a one-session conference event to a practice mainly workshop, from a Business Point organization in the CO-OP, to a 3-4 week CO-OP Seminar Series. The career support activities can be arranged in the university, as well as out of the university. Either a part of it can be in the company building or the whole can be outside like a field trip. Besides Branded Courses, we organize 3-4 week seminar series with our partner companies. These programs which are organized in special topics and fields, contribute to our students in different areas like; having an opinion in current issues, networking and tending to customized fields by recognizing the sectors and companies. CO-OP Directorate crates a talent pool with highly qualified students who have different potential and competencies. These students are provided opportunity to meet with partner companies according to their competencies and different qualifications. Trainings can be planned and implemented to the students of the STP with mentoring and feedback meetings for preparing them to professional business life and contribute to their personal development. The students in STP are given priority in special projects carried out with companies, Reverse Mentoring Programs, Y generation practices, and career support activities. 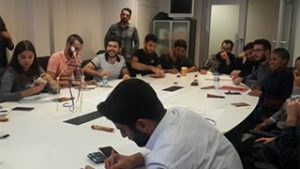 According to their concrete projects those who have strong entrepreneurial direction or who want to advance through their own business are directed to the Incubation Center.